"I fell in love with the characters like I never had with any romance novel ever before. Every few years, I read it again. I had never, ever done that with a book before. And this isn't the only one of Ms. Horsman's books with which I've done that, just the one that I've read the most. She really knows how to draw you into the story where you can't put her books down!! "Wow! 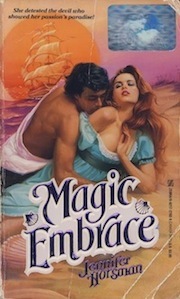 As an avid romance novel reader I have to say that this is my favorite book ever! The book has everything a great romance needs: passion, sexual suspense, laughter, and a hero that you would just die for! This book is a must read!" Black Garrett--pirate, sorcerer, British spy--first mistakes the innocent beauty Juliet for a cold blooded murderer, responsible for his dear brother's death. By the time he discovers his mistake, it is too late to save Juliet. Garrett is forced to imprison the hauntingly beautiful and rebellious young lady against her will. Their warring, entwined fates ignite a passion that has the awesome power to save the world. Knowing only the confines of her room and the worlds between the covers of books, Juliet Stoddard could hardly believe the unfolding nightmare; she had no idea why this terrifying legend had kidnapped and imprisoned her against her will. Bewildered and betrayed, she knew only that she was powerless to escape the devil's trance and wrest free of his magic embrace. Garrett looked up while simultaneously reaching out to catch the brush in midair. He set it lightly on the table. The most maddening thing Juliet ever witnessed was the speed of his reflexes. With a pained gasp, she threw herself against the pillows. "I can't bear it! You have no right to do this to me! You especially have no right to pass a single judgment on Tomas, yet alone make these horrid insinuations about his neglect of me, when all I ever knew from him was a gentle hand, concern, decency! Decency you don't even know, yet alone have! He has more moral fortitude in the small of his finger than you'll ever have in the whole of your life!" Tears misted in her eyes, momentarily blinding her as Garrett came over to the bed. "You're not fit to say his name! Do you hear me? When I think that it's you who has hurt me, you who have terrorized and threatened me, you took my virginity by force when I belong to him by marriage—"
She stopped as he leaned over her, his long arms braced on either side of her shoulders, staring down at the maddening sight of her like that, taking in everything: the blue satin rope beneath the flaming dark silk of her hair, her thin arms raised over her head, the white silk of the night dress doing blessedly nothing to hide the slender curves beneath, the bright fury mixed with tears in her eyes as she returned his gaze, far too furious to be afraid. "Aye, love, I am laughing at you. For the part of your child's tantrum that is truly amusing is this idea that the reason I got here first has anything to do with a difference in moral character. Because, love," his eyes were wild with the humor he saw in this, "the only reason I got your innocence before he did has to do with a piece of a man's flesh and the ability to use it." The second she understood the meaning of the insult she raised her arm and landed a hard slap to his face. "I hate you!" Pain shot up her arm from the impact but she never felt it. Instead, every nerve in her body ignited with the long wait for his response. Which came with a low chuckle. He rubbed the side of his face before his hands came over her raised arms, keeping them pinned to the bed. "You are a fool if you think this has anything to do with hate."